LOGAN, Utah, Jan. 23, 2017 (Gephardt Daily) — The section of U.S. 89 that winds through Logan canyon is closed Monday morning, due to the extreme snowy weather. 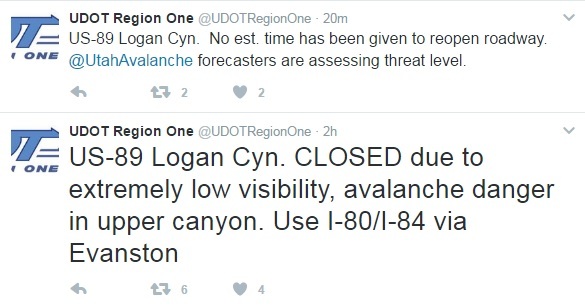 The Utah Department of Transportation Region One posted on Twitter that the closure is due to extremely low visibility and avalanche danger in the upper canyon. UDOT recommends drivers use Interstate 80 or Interstate 84 via Evanston, Wyo., as alternate routes. Utah Avalanche forecasters are assessing the threat level. No estimated time has been given for the roadway to reopen.